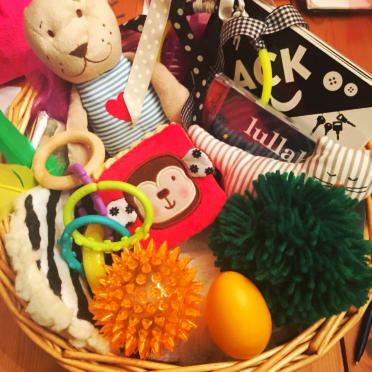 My Newborn pack/basket is designed to stimulate the senses from the beginning. It comes with a leaflet providing examples for use. As baby develops the Treasure Baskets/packs are custom made to stimulate, using a mix of natural materials and real world items, which are designed to support all round development. Including; cognitive development, curiosity, motor skills, language, social skills, communication and listening skills. 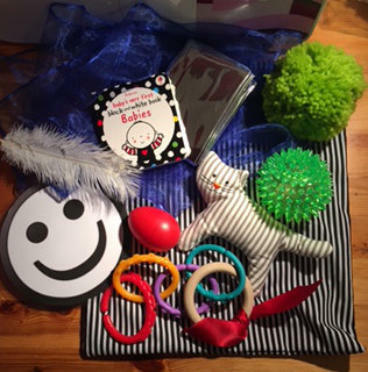 Our sensory resources are designed to grow and develop with baby making them unique and individual. Sensory Treasures provide a selection of baskets and bags containing a variety of contents. Early learning activities supporting cognitive and physical suit your baby. The contents can be tailored to baby’s interest and age. Orders can start with a Treasure Basket/bag at birth that it can be added to at 3, 6, 10 months as baby develops. A subscription package is available over baby’s first year (please see below). The Newborn pack comes in a black and white drawstring bag and ready for use with any newborn, including idea leaflet, making an ideal gift for any occasion, including baby shower, newborn, christening etc. The pack is ideal for taking out and about, for travelling, appointments, shopping etc. Alternatively the Newborn Basket comes in a good quality wicker basket, made to last and can be added to as baby develops. Why not complete my bespoke form and let me custom make a set of treasure to suit your baby. From birth baby will enjoy learning through sensory experiences, what they see, hear, taste, smell and feel. They will love watching and listening, as you help them to explore, scarves, woollen pom-poms, feathers, sliver sheet, bells, shakers and different containers filled with a variety of contents. Check my blog for more ideas and information. The benefits of Treasure Baskets by far outweigh that of expensive brightly coloured toys. However, because of the contents it is advised to supervise Treasure Basket exploration and to check the contents regularly. Subscription for Newborn/baby includes the contents in both pictures (contents may vary slightly) with the addition of a further two packs. The first pack is delivered within baby’s first month following their birth. As pictured this comes in a drawstring bag with contents and leaflet. The second delivery, as pictured, includes a wicker basket and contents. This will be delivered between 3 to 4 months. You will receive your next pack when baby is between 6 to 7 months of age, and then the final pack to add to your baby’s basket will be posted between 10-11 months. In order o get this right for you and baby, I ask that you complete the bespoke, bespoke form. I will then contact you direct. The cost of the Baby Subscription is £152.00 including P&P. 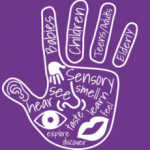 Sensory opportunities are so important from birth for developing a foundation for future learning. Babies are learning through their senses before they are born. They can hear from 16 weeks gestation and see from around 7 months. They hear sounds inside the womb that can be of comfort to them when they are born. For example, the first sounds to reassure baby is that of their mothers/fathers/carers voice. 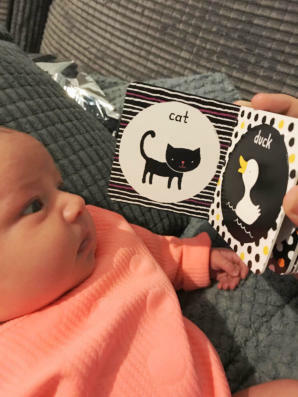 Baby quickly makes the link between the voice that they heard in the womb to the face that they see when they are born. This helps baby feel safe and secure. They remember sounds such as; music, television, pets, vacuum, traffic etc. This is just an example of the many reasons why it is important to provide sensory opportunities from birth. 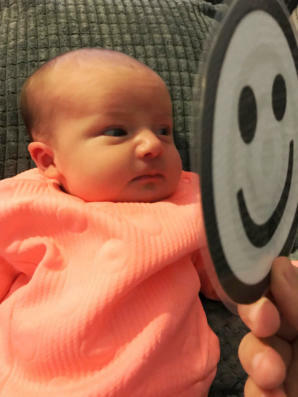 In the beginning baby can see faces at a distance of approximately 15-20 cm, so it is important to hold them close. Also, in the beginning they see light and dark patterns, as their vision is developing, and prefer to look at bold black and white patterns. They often stare at the window or bright lights against a dark ceiling for the same reason. If you would like to receive information on special offers and latest products please click on the hand to join our mailing list.